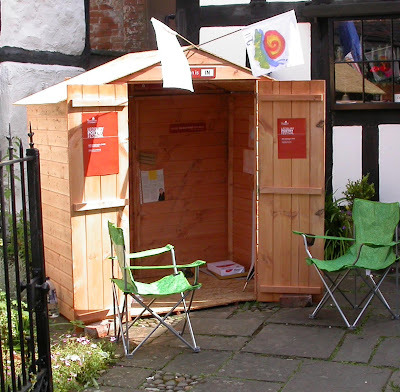 Here's a shot of Shedman's shed at Ledbury - or should that be Shedbury - Poetry Festival. Kindly provided by B&Q Hereford, the shed was raffled and raised £100 for Cancer Research UK. If you have any more shots of Shedman in Ledbury do send them in. You can find Shedman's email address on his website. Many thanks to everyone who called by to say hello to Shedman, share a shed story and the odd poem or two.